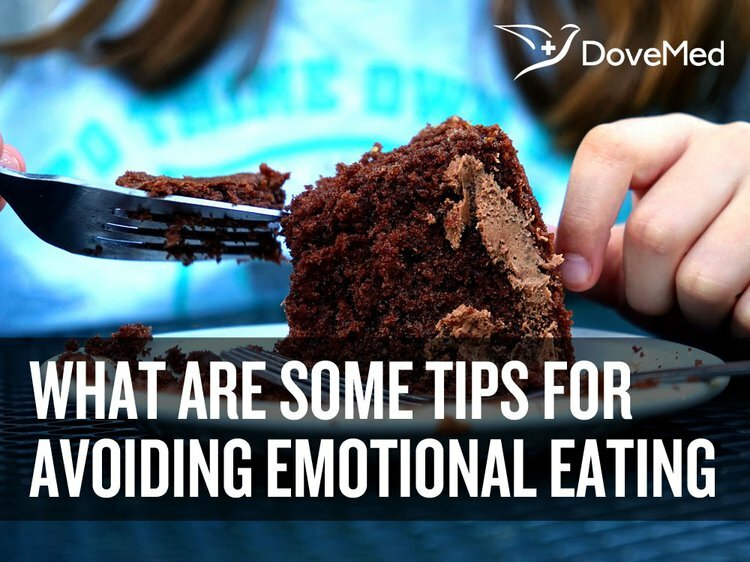 What Are Some Tips For Avoiding Emotional Eating? Emotional eating is not always a self-control problem. We should be mindful because emotional eating can ruin your hard work in weight-loss if high-calorie, sweet, or fatty foods are consumed. When life gets stressful, some of us tend to look for comfort from food. Sometimes, we eat when we are bored to pass time. Turning to food can be conscious or subconscious that drives us to eat. Emotional eating is not always a self-control problem. We should be mindful because emotional eating can ruin your hard work in weight-loss if high-calorie, sweet, or fatty foods are consumed. 1. Locate what triggers you to eat more: Finding the cause of your emotional eating is key to healthy eating habits. Stressful life events, like recent unemployment, financial pressure, health related issues, relationship conflict, annoying bosses, and fatigue, trigger intense emotions and potentially lead to emotional eating. Boredom can cause eating to occupy time. 2. Rethink about stress: Stress is a response to a stressor such as a stimulus or environmental condition. Think of stress as a reaction to an event rather than the event itself. If the stress contributes to your emotional eating, known as stress eating, try a stress managing technique such as yoga, meditation, or relaxation. 3. Distract yourself from boredom: Sometimes, we eat when we have nothing to do. Instead of snacking when you are not hungry, distract yourself. Take a walk, read a book, or learn something mentally stimulating to help yourself to stop eating. 4. Understand the difference between food craving and hunger: Just because you desire a particular type of food, it does not mean that you are hungry. Cravings stimulate the brain to begin expecting the flavor of your desired food to make you start salivating. It is different from hunger, which is a condition in which a person is unable to eat enough food to meet their basic nutritional needs. 5. When you are hungry, eat mindfully: Eat until you are full and try not to stuff yourself. Stuffing yourself can confuse the digestive enzymes in your stomach and fatigue your digestive organs. Too much stress on the digestive system can create a backup of toxins. These toxins may stay in the body for a long period of time. A long-life habit of overeating can result in colon disease, obesity, heart disease, and a myriad of other digestive and weight problems. 6. Get support: You are more likely to give in to emotional eating if you lack a good support network. Talk to family and friends or consider joining a support group. 7. Stay away from temptation: Sometimes, the best way to resist emotional eating is to stay away from sugary or fatty foods altogether. Do not keep supplies of comfort foods in your home, if you find them too hard to resist. 8. Snack healthy: If you feel the desire to eat between meals, choose fresh fruits, vegetables, nuts, or unbuttered popcorn. 9. Do not deprive yourself: Reward yourself once in a while for accomplishing a particular weight goal. Refraining from your favorite foods permanently is punishing yourself, and you want to make a healthy lifestyle fun and not a chore. Let yourself enjoy an occasional delight and get plenty of variations to help curb cravings. 10. Learn from setbacks: Do not beat yourself up for relapsing into bad food. The best thing you can do is forgive yourself for compulsive eating and learn the reason why you resorted to emotional eating during that time. Start fresh the next day! If you find that you are having trouble with emotional eating and cant curb the bad habits, talk to your dietician or healthcare provider about other ways to rid yourself of the negative behavior. Baillie-Hamilton, P. F. (2002). Chemical toxins: a hypothesis to explain the global obesity epidemic. The Journal of Alternative & Complementary Medicine,8(2), 185-192. Canetti, L., Bachar, E., & Berry, E. M. (2002). Food and emotion. Behavioural processes, 60(2), 157-164. Geliebter, A., & Aversa, A. (2003). Emotional eating in overweight, normal weight, and underweight individuals. Eating Behaviors, 3(4), 341-347. Kido, Y., Hiramoto, S., Murao, M., Horio, Y., Miyazaki, T., Kodama, T., & Nakabou, Y. (2003). ε-Polylysine inhibits pancreatic lipase activity and suppresses postprandial hypertriacylglyceridemia in rats. The Journal of nutrition, 133(6), 1887-1891. Rogers, P. J., & Smit, H. J. (2000). Food craving and food “addiction”: a critical review of the evidence from a biopsychosocial perspective. Pharmacology Biochemistry and Behavior, 66(1), 3-14. Groesz, L. M., McCoy, S., Carl, J., Saslow, L., Stewart, J., Adler, N., ... & Epel, E. (2012). What is eating you? Stress and the drive to eat. Appetite, 58(2), 717-721. McEwen, B. S. (2007). Physiology and neurobiology of stress and adaptation: central role of the brain. Physiological reviews, 87(3), 873-904. Adam, T. C., & Epel, E. S. (2007). Stress, eating and the reward system. Physiology & behavior, 91(4), 449-458.